Cupcakes 'n Daisies: The book tour continues . . . 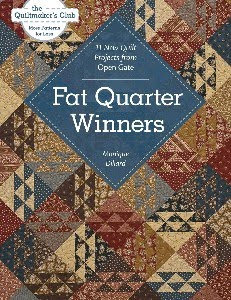 Fat Quarter Winners, by Monique Dillard and published by C & T Publishing. I've chosen this pattern, Crazy Eights, as my first project to make from the book. The first of many I'm sure. So the quilt is made up of 84 of these blocks. I'm going with a mix of black and red fabrics, some are from Sophia, by Windham, 19th Century Red, also by Windham, and any other black or red fabric in my stash that caught my eye. The pattern calls for 8 blocks to be made from the same red and black fabric combination, and to use 10 different sets of black and red fabric, I'm going with 4 blocks and increasing the number of red and black fabric sets to 21. 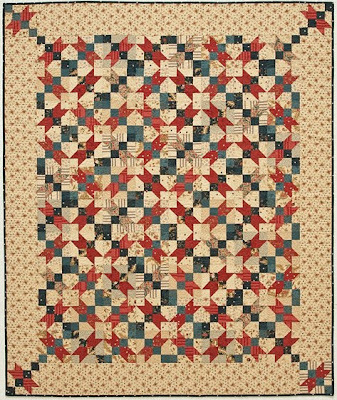 The pattern also calls for a scrappy background but I'm going with the same background for the whole quilt. After I made my first 4 blocks I threw them on my design wall. It then occurred to me that this pattern would look really good with just three fabrics, one background and two contrasting colors. I've got all my strip sets cut so I'm going scrappy, but keep that in mind if you decide to make this pattern. We thought it would be fun to each do a tutorial this week on a technique required to make one of the patterns in the book. For my tutorial, I'm going to explain how to use Monique's Fit to be Geese rulers. My pattern does not use flying geese, but I'm such a huge fan of this method of making flying geese that I asked to do this tutorial, and since I whined and pouted about not getting to make Pinochle for the book tour, the other three ladies let me pick my favorite for the tutorial. The Fat Quarter Winners book and the ruler both provide great directions for using the Fit to be Geese rulers. The book also provides an alternate way to make flying geese, one that does not require you to buy the Fit to be Geese rulers, which is nice, but really, once you see how easy it is to make the geese, you'll want the ruler. So the rulers come in two sizes, regular and mini. you can make geese ranging in size from 3/4" X 1 1/2" to 3" X 6". For this tutorial I'm going to make the 1 1/2 " X 3" geese. The ruler provides the fabric requirements for each unit and yields 4 geese. I needed one 4 1/2 " square and four 2 3/4" squares of fabric. Cut the large square diagonally twice and the small square diagonally once. These are the pieces you need to make one unit. Line up the background or sky unit along the left side and bottom of the geese unit, right sides together, and sew. The side of the sky unit is supposed to hang over the top like that. Press open, towards the background unit. Then add the right background triangle. And press open towards the right background triangle. If it looks a little wonky, don't worry, that's what the ruler is for. Trim the top of the unit with the ruler placed just like this, where the rooftop fits right into that seam. The top's done, straight and neat. Then rotate the ruler 180 degrees and trim up the bottom. a perfect 1 1/2" X 3" single unit. This method suits me because you start with a piece that's a smidge big and trim it up, I like to do that whenever possible with any block that I make. That's all there is to it, easy peasy. These rulers are available at a quilt shop near you or from Monique's online Bundles and Bolts store. I hope this tutorial was somewhat helpful to you, and if it was not helpful, I hope it was at least entertaining!! A big thanks to my helpers, The Cutesters. It really is the best way to make flying geese! The only way I get perfect flying geese is by using those rulers!! Thanks for the tutorial. I have never seen the ruler before but will be on the look for it. I use that ruler often for perfect flying geese. Love it!! Thank you for showing us how the ruler works. 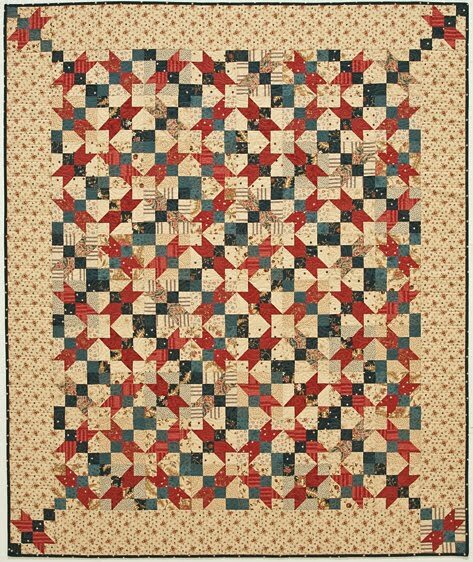 I wish more people did demos like this as there are so many rulers out there, it's difficult to know which ones work best with my quilting style. Seeing a demo helps me make a decision whether or not to pick up one. Love the cute characters! Love your little helpers Thelma! I need some little critters like that to help me get my blocks done! Thelma, you have the cutest helpers! They are inspiring. Thanks for the tute on the rulers. I love your little "helpers"! Thanks for the nice clear instructions - I too like to make my geese a bit big and trim down to the perfect size. Your helpers are adorable! I love what you've decided to do with the fabrics and thanks for a fantastic tutorial on my favorite ruler! I got both sizes of this ruler for Christmas and it literally changed my quilting life. I could not have made my MGF without them and I find myself eyeing up other patterns with flying geese just because I know how fun they are to make! I tend to chain stitch them and press them and then stick the uncut ones in a bag with the rulers, a rotary cutter, and a 6" rotating mat to trim while hanging out with family or watching TV with my husband. Quilting progress while still getting family time in! Very nice tutorial Thelma~ and adorable helpers! :-) Have a happy day! I love that ruler and have depended on it for several quilts! Your tut was wonderful Thelma! Thelma, I think you could be a used car salesman. You have sold me on the fit to be geese ruler. Thanks for the tutorial. I have the rulers and will refer to your tutorial when I use them. Your little helpers did a great job! Great tutorial Thelma...I love the flying geese ruler...they come out PERFECT! no clipped off wings. Love it! I CANNOT believe you have not made Ashley a Disney themed quilt. I truly dont know how you make such beautiful and so many quilts (and a fabulous daughter too!) but seriously how have you not made a Disney one yet?! I hope this comment inspires you to make amazing Disney quilts for the both of us :) By the way, thank you for the perfect ornament. I loveee it! Glad to see vinylmations actually put to use, now if only they made a daisy one too. I think you wore the Cutesters out, Thelma! They really looked tuckered out on the last photo of your wonderful tutorial! The flying geese ruler looks like a really good new tool. I'm new to geese and have difficulty with the accuracy. Thanks for the great tuto. Thanks for the tutorial, Thelma! 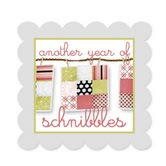 AND thanks for the Schnibbles Patterns from your give away!! I received them yesterday when we got home!! Love them all!! 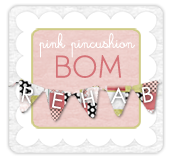 I blogged about the win today...check it out!! Many thanks! I'd love to be the lucky winner of your book and set of rulers---Thanks for the chance! I read your blog everyday. Enjoy it so much and would love to win! !